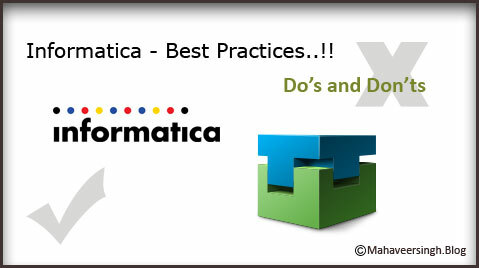 Informatica – Best Practices, Do’s and Don’ts..!! Shortcuts (Shared Folder) – The uses of shared folder to use the sources/targets around multiple folders keeps your repository and objects less and clean. A shared folder allows you make the best use of re-usability in Informatica and maintains consistence and standard and keeps the code in tact with less number of duplicate objects being created. Re-usability – It’s always good to take advantage of re-usability options on Informatica with the Mapplets, Worklets, reusable transformations, tasks etc. which highly reduces effort on design and keeps things simple. Simplicity – This is the practice to keep your mapping/code as much as simple as you can, it can be good to have multiple mapping to do things rather than one to do something more complex. Mapping or your code should be easier to understand and debug in the future. Source-Qualifier – It’s the place where you can tap your required data and filter out unnecessary column /rows that are no were relevant to our requirement. It’s always good to tap out the data at SQ rather than allowing them to be processed and being filtered at a later part of your mapping. Filter Transformation – It’s the best you use your Filters as close as possible to the Source, to allow lesser data to travel across your mapping and thus improving the performance of your mapping with minimal data. Most important of all, avoid complex expressions and logic on your filter condition, it’s always good you make them all in your Expression transformation and decide with a Flag port that travels on to the Filter and makes the Filter transformation far too simple and better. Expression Transformation – It’s always good using more operators (||,+,/) rather than Functions where ever required, and also the processing and loading of Integer type data is always the faster compared to String type. Good to make use of local variables and keep the calculations as much as simple as possible with multiple variables being used to breakdown the complex calculations to less redundant and easy to understand one. Joiners – If possible, join the data at the SQ, and in case of must to go for a JOINER transformation make sure you use the Source with less records used as the Master and the other source as the Detail which has more records to process. Parameterize your code – Wherever possible it’s always the best thing to do is to parameterize your code, this helps in making the code easy for any future changes to be made with no change on the Informatica code. Avoid hard coding values, and parameterize them which can ease for any changes going forward. SQL Query – Always the most important thing to check for is how good your SQ or any SQL related process will work on the DB side. Your source/target relational object on the DB side should be good enough to handle any UPDATE/INSERT/SELECT process more effectively. Go for the SQL execution plan, and accordingly add Indexes (Clustered/Non-Clustered) as and when required on THE DB table. Router transformation – Always use a less complex conditional expression on the Groups of your Router, avoiding any calculation/function being performed row wise at your router eating away more time and memory in running your session. Instead do your conditional checks for grouping on the expression prior to loading to the Router and just keep it to a Flag which decides the Grouping on the Router making it perform at its best. Never use a Filter after a Router, which makes it logic less use, as the Router is to perform a Group, and hence the filters can be added alongside the logic of your Grouping (which again can be handles at an expression in getting the Flags to group by). Lookups – Also try using unconnected lookups wherever we can as it gives space for re using the same Lookup multiple times and can use the same value to test/calculate in expression. Use Filter on your Lookup source to avoid Caching in unwanted data thus optimizing the Cache use improving the performance. Try using a Joiner instead of a connected lookup wherever possible. Union Transformation – The lesser the Union transformation, better is your mapping performance. Try avoid using Unions and if used keep the number to minimal by trying to Union the source on SQ itself as the Union consumes a lot of Memory and time in processing being an active transformation. 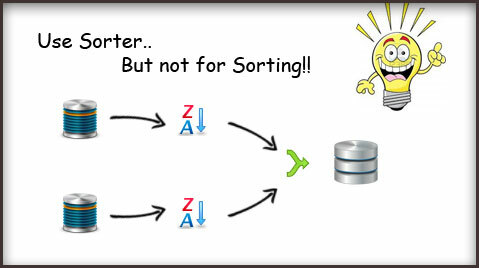 A different use of Informatica Sorter..not only to sort!! I have been trying to get on with this article for a long time, but have been moving around with other commitments. 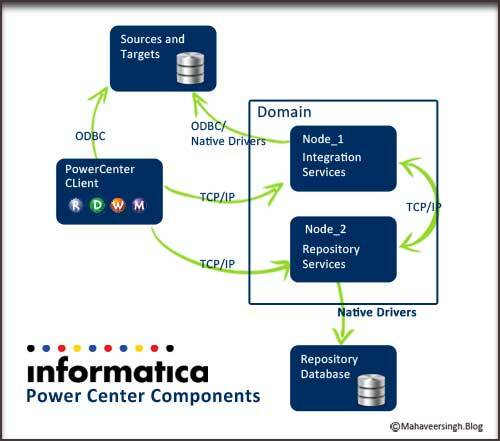 Finally time to share a interesting topic with all Informatica nerds. Not so functional or a logical thing i am here with to share with you guys, it was just about how i made use of Sorter and never meant to sort things! Confused?? OK without much ado lets get on with this.. I was in a need to compare 2 results from same source (SQL Table) and then do an update on the same, kind of a data clean up activity i was involved into. And so i was just done with my mapping design and then just went on to run the session as well. But to my surprise, all i see was the queries, 2 source tables was competing with each other and also there was an insert/update on the target end leading to lot of pressure onto the DB and hence resulting in the process to hang with data load literally halting. Then a bulb glows (a bit late though).. and the thought was, why cant i tap the data at one point and once it reaches, then to open the tap. But how? As we all know we have ‘The Integration Service passes all incoming data into the Sorter transformation before it performs the sort operation.’ I just made use of this feature, and as you all might have got it by now, i used 2 sorters at the 2 source flows coming in and joining and then once the source is read with different SQ SQL overrides, all the transformations are performed and finally the data is written on to the same SQL table. Hope this gets as a Savior to you too at a similar point when you are helpless!! Just in a situation when i was in need of a guide to help me in getting a Bulk import/export done i was struck as i was not getting one good article that can help me in doing. It was all in bits, hard to get them all in one place and get what i expect. Let me take up this and get it down here, hope this helps for a better understanding. We had some data in a flat file populated with the and ETL (Informatica) tool and now i have to load the same data to my SQL database table as a bulk load. And to load your data as bulk we have the BCP utility that comes in handy in allowing bulk load from data file to the SQL table and vice verse. 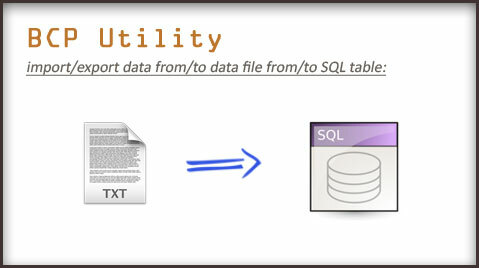 in/out -> ‘in’ for import from data file to sql table and ‘out’ for export o data file from the sql table. This is the simple bcp command that can help you load data faster and in an elegant way. There is one add on feature or a parameter that you can define for the bcp command which can make the load from and to the data file more tightly mapped and Provides a flexible system for writing data files that requires little or no editing to comply with other data formats. Just curious to write on this, something not every one would be aware of. This can be really useful in finding the real BUG in you Informatica code. This one good thing in Informatica has a lot to say. Yes when you have a error thrown on running your Informatica session with a row returned to the Bad file, would wonder how can the bad file help or why do we need a bad file to just see a rejected row in it!! With combination of the session log along with the Rejected bad file can be a a life saver for any Informatica developer. The Rejected bad file saves at the path $PMBadFileDir (by default a bad file directory in your Infa root folder). issues. How to track what is what here?? That is where the bad file concept comes into the picture to help us out. We have two indicators in a bad file, the row indicator and the column indicator. Where the row indicator says about the whole row and the column says about each column value whether its a valid or an invalid data. Tips: For a clear and easy reading of the bad file, Save it as a CSV file and open it. 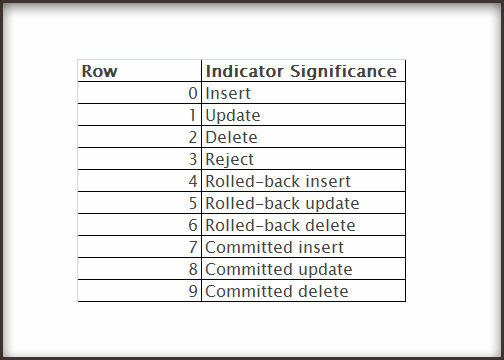 The first column in the reject file is the Row Indicator , that determines whether the row was for insert, update, delete or reject. It is basically a flag that determines the Update Strategy for the data row. When the Commit Type of the session is configured as “User-defined” the row indicator indicates whether the transaction was rolled back due to a non- fatal error, or if the committed transaction was failed. 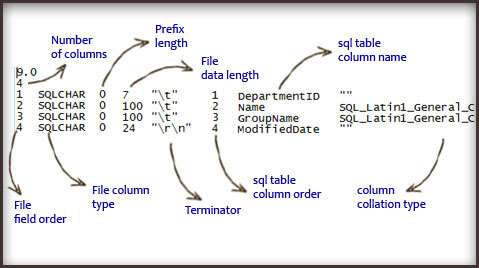 Then is the column indicator, each one along with respective column in the bad file gives the column indicator. 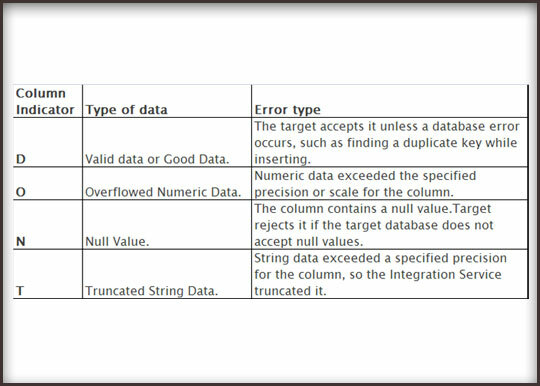 It says about the column data that was being inserted/updated to target and might have rejected. The column indicator has several meaning to its value as is shown below. Update Override, why? where? when? We have a an Update strategy transformation to perform any kind of update on the target table, then what is it all abot the usage of Update over ride in a target. Before we can jump into our topic, for all those who are new to Update startegy -> Update startegy transformation is something that can help you in updating your target table with the new values on the basis of the Primary key match. So now lets take up the use of Update Over ride option, as i was going through this particular scenario i had to Update my Target table with the new values, but not for the Primary Key Column. Rather i was in a position where i had to update the table on the equation of non Primary key column. As an instance, i had to update the salary of Employees of country Australia. WHere as in my table i do not have the Country column as a Primary key (Employee_ID shall be a Prmary key here). We got to update this!! but how? And this shall update the records with the new records (changed salary) that have the country = ‘Australia’. SO this is where the Update Override comes as a help in hand.